Today I find myself wanting to question why I do what I do. Instead of going down that path, I am reminding myself it is because I am compelled to, and because I can. Interesting how much we can doubt ourselves in creating. Not creating wouldn’t be a better choice for me. This entry was posted in musings on September 24, 2011 by dahlia. I am using a padded 14″ x 20″ ironing board, with a layer of vinyl fabric over top, and an old cotton sheet on top of that. The two bird images were done with acrylic paint with fabric medium added. The screen was made with wet, torn newspaper. I posted two images, the first and third prints, to show how much the edges softened in subsequent printings. The flower images were done with a freezer paper stencil. The opaque green one is speedball fabric screenprinting ink, and the more translucent green one is colour vie fabric paint. I found with all 3 paints I required 2 passes to get solid colour. The biggest challenge I had, I think, was that my squeegee wasn’t quite wide enough to cover the whole width of the open screen, so in the flower ones where I was printing the whole width, the very edges didn’t always get full coverage. This entry was posted in techniques on September 17, 2011 by dahlia. I have a great many tactics for avoiding spending time drawing. Which, when I am developing a series of quilts based on my doodles, is in no way a good thing. My confidence in my drawing, and my drawing habits, need to improve. Being me, I usually end up taking a drastic approach. True story – in university I chose my major, Chemistry, to get over the fear of blowing myself up in labs. Starting in a week, for six weeks, I am going to devote ALL my studio time to drawing, except for 2-3 hours per week to work on finishing Life Study quilts that are waiting in the wings. I had already signed up for Lyric Kinard’s Artist’s Toolbox course. I had signed up to do Carla Sonheim’s Silly Drawing with my daughter. I have Carla Sonheim’s Imaginary Creatures course materials, and her book Drawing Lab. And if that’s not enough, I have 100 Creative Drawing Ideas from the public library, and Finding your own Visual Language in my personal library. I am going to keep track of my hours in my timesheet, so that I don’t avoid drawing by avoiding studio time. At the end of the six weeks, I will have more confidence in my drawing, have better drawing habits, and a lot of source material to use in quilts. This entry was posted in musings on September 16, 2011 by dahlia. Since it’s clean, I thought I would share a photo of my studio space. The other half of the room is our office. I have a small closet, and shelves in the bedroom that I use for storage as well. This entry was posted in Uncategorized on September 12, 2011 by dahlia. I am trying VERY hard to focus my studio time and energy on the Life Studies series. I’m viewing it as an excellent way to learn and explore, and hopefully build up to the larger pieces I envision, but can’t yet get down on fabric. I had decided to take no more classes for the time being, in part because it looked like our work would be too busy in the fall. However, it looks like I should have just enough time to take a couple of small ones, both of which have been calling to me. I think that screen printing is a good tool if I want more consistency in my surface design, and in applying lines to my creatures. I have dabbled in it a little on my own, but I know I will focus better if I participate in a class. 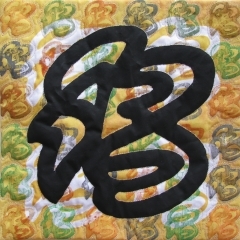 I have signed up for Lyric Kinard’s Freeform Screenprinting class at Quilt University. Likewise I want to develop my art skills further. I have signed up for Lyric Kinard’s Artist’s Toolbox course at Quilt University. This entry was posted in musings on September 3, 2011 by dahlia.